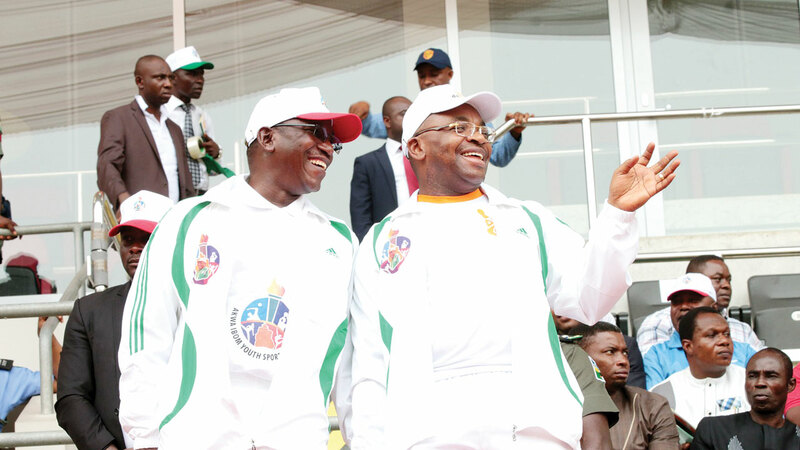 Governor Udom Emmanuel (right) and Sports Minister, Solomon Dalung during the Akwa Ibom State Youth Games in Uyo…recently. Sports have always been a veritable tool for national development, as it offers limitless opportunities for all sectors of the economy to integrate and foster benefits for future generations and organisations. In Akwa Ibom State, sports development has over the years become one of the focal cardinal points that have propelled the state to global limelight. The state has also produced world-class athletes and administrators since its creation on September 23, 1987. These athletes and administrators have become models and ambassadors promoting the ideals of sports renaissance of the state government. At 30, the milestones of good governance and the sports sector in Akwa Ibom State has been highlighted by the many success stories, especially under the leadership of Governor Emmanuel Udom. Among the candidates for the Akwa Ibom State House, Governor Udom Emmanuel was the only one with a blueprint for sports development during the campaigns. And he has sustained a philosophy that ensures grassroots sports development remains the bedrock for future successes. One of the earliest foundations of the success stories in the state was the feat by Akwa United in November 2015, barely six months into the lifespan of the administration, where history was made as the team won the Federations Cup in Lagos State. That historic feat, marked the beginning of the Dakkada belief in the state athletes and the new signature tune of self belief, the I can do spirit of the Akwa Ibom person… to rise beyond any challenge to excel became the working template which sent positive signals to the outside world. The conception and development of sporting centres across the 10 Federal Constituencies has become a welcome development and opportunity for budding stars at the grassroots to utilise and consolidate on their techniques and other technical content, especially the zeal to ensure that education remains the driving force behind the sporting successes. At the second edition of the National Youth Games held in Ilorin, Kwara State in 2015, Team Akwa Ibom emerged fourth out of the 36 states and the Federal Capital Territory, which featured. More importantly, the state remained at the echelon of national sports competitions as they had finished second in the first edition. The reorganisation of Akwa United Football Club under the professional management of veteran journalist and CAF, FIFA Instructor, Etubom Paul ‘ Sports’ Bassey re-engineered the story of the club, which in the past battled relegation waters season after season. But in just his first full season in charge (2016/2017), Akwa United finished fourth on the final league table of the Nigeria Professional Football league. The best position ever reached by the club since its formation. The story of the beautiful season for the club gaining a continental ticket remains on course as they are aiming for a place in the Aiteo Cup semifinals with a great optimism for the final push. Today, Akwa United has become a national brand with fans spread across the country. 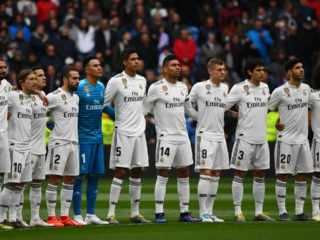 The team’s welfare remains a reference along with a highly respected technical crew that have redefined the style of play of the team to perhaps not just being a delight to watch but one of the most entertaining sides to watch all season. The story of football competitions being hosted recently is another landmark with the Godswill Akpabio International Stadium being the new fortress of the Super Eagles. Governor Udom Emmanuel has ensured that the Super Eagles have fared well in Uyo as the hospitality and provision of every detailed facility has become well adopted by the Super Eagles, who in the next few days will return to Uyo to sustain the momentum of their World Cup qualifier-Africa (Group B), as they get set to fly past the Chipolopolo of Zambia. 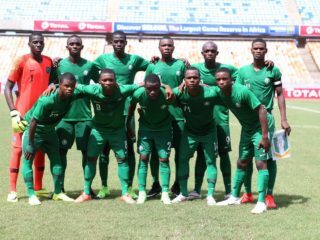 It is a must win encounter that will ensure Nigeria becomes the first African country to qualify for Russia 2018. One of the most formidable milestones of the Governor Udom Emmanuel administration is the historic feat of successfully hosting of the first Akwa Ibom Youth Games in February 2017. The vision of the games stemmed from Team Nigeria’s poor Olympic run at Rio Summer Games 2016. Governor Udom had charged sports administrators in the state to ensure that a long-term programme for sports development is charted to ensure that the state gets on the global map of sporting excellence in no distant future. As such, when the Akwa Ibom Youth Sports Festival was held, it broke new grounds in sports development as stakeholders, including the Sports Minister, Solomon Dalung, urged other state governments to emulate the success story in laying a firm foundation for the future of our budding talents at the grassroots. Over 6000 youths drawn from various schools across the state were camped and participated at the Games, which were heralded as a historic first of any kind by any state in Nigeria. The state has continued to reap the benefits of the Games as Team Akwa Ibom at the third edition of the National Youth Games, which ended last week in Ilorin, Kwara State, finished second behind eventual champions, Team Delta with 16 gold medals, 15 silver medals and 15 bronze medals. At 30, Akwa Ibom State has set new standards in the drive to usher rewarding economic benefits through sports and education. The templates of the long term gains as spelt out by Governor Udom Emmanuel clearly shows that our youths must live a foundation endowed with education and sports as a pivot to compliment the strides that will bring more honour and reward to self and motherland. Also among those appointed by Governor Emmanuel to pilot the state’s sports renaissance is the Commissioner for Youth and Sports, Sir Monday Ebong Uko, who has always emphasized that “efforts put without results achieved means nothing.” To that extent, he has always pursued his set targets with the determination to uplift the standards of sports development in the state. There is also the permanent secretary in the Ministry of Youth and Sports, Coach Aniedi Dickson, who is the first professional athlete to attain the career height in the ministry. He has brought his wealth of experience to consolidate on the gains of the state in sporting events.